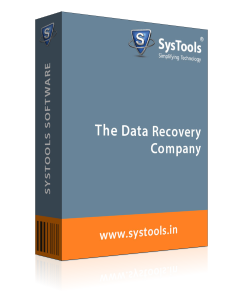 XLS Repair software is the best Excel file recovery application which can fix & recover corrupted / damaged Excel XLS files. The simple and user friendly Graphical interface makes the application popular. It eliminate errors in XLS file and bring Excel data file back to healthy state. 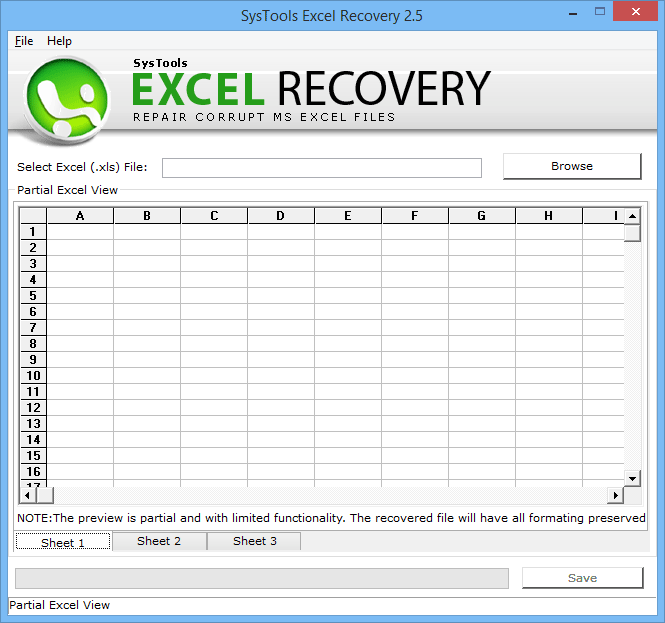 The Excel repair tool allows the user to resolve all types of corruption issues in XLS file. There are many possible reasons for XLS file corruption like virus attack, abrupt shutdown, Trojan infection, and other human errors. The product will fix all .xls file issues. The XLS Recovery application will scan and repair damaged Excel file when a .xls file is loaded in it. It fix entire Excel spreadsheet errors and issues. Once the.xls file recovery is done, a user can preview overall spreadsheet with the complete rows and columns. Also formatting of the .xls file will not be compromised at any cost. Microsoft Excel Repair software is developed with the minimum complexity and offers a simple graphical interface to its users. All the options are present in a single pane. 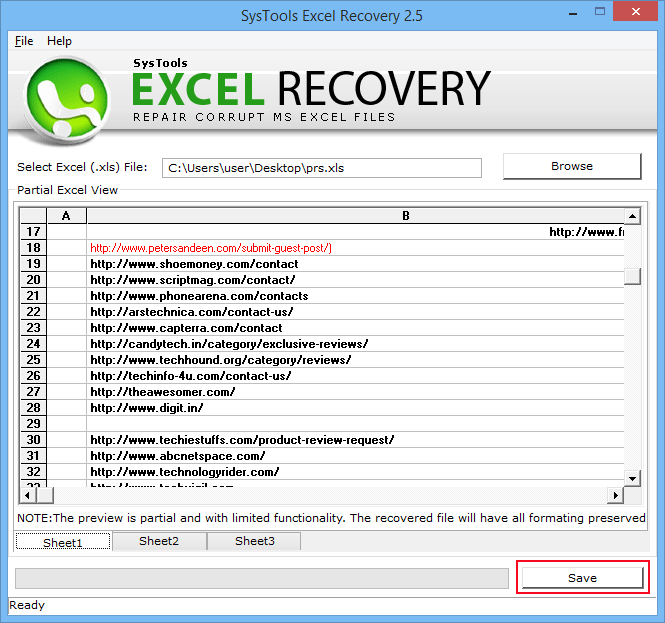 XLS Recovery tool will avoid all the confusion which can occur to a user while repairing Excel XLS files. 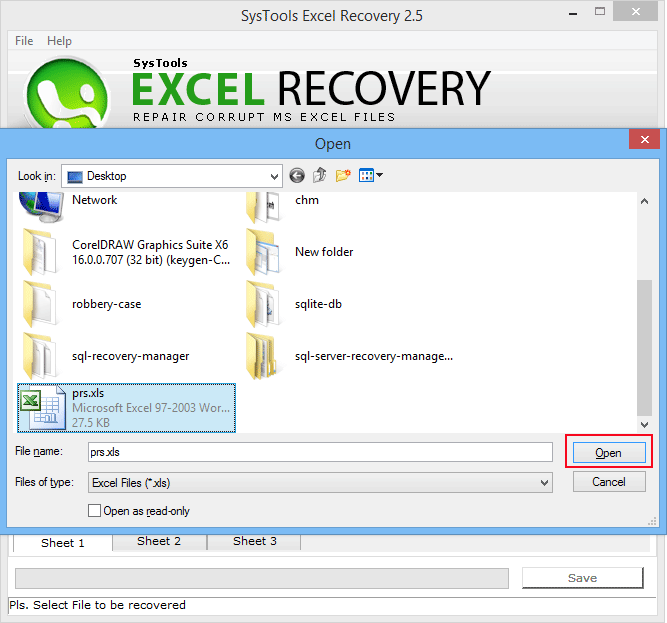 The Excel data Recovery utility repair corrupted Excel files and turn into healthy state. The original formatting of the XLS file is not disturbed even after recovering damaged EXcel .xls file. The formulas, hyperlinks, comments are precisely maintained which are embedded in the XLS file. The XLS Repair Tool facilitates a user to save the healthy Excel XLS file at any location on the hard disk as per the need of users. Moreover, the Excel file repair software gives an option to create a new folder directly from the program pane. Q. How to extract Spreadsheet data from a healthy Excel XLS file? Q. 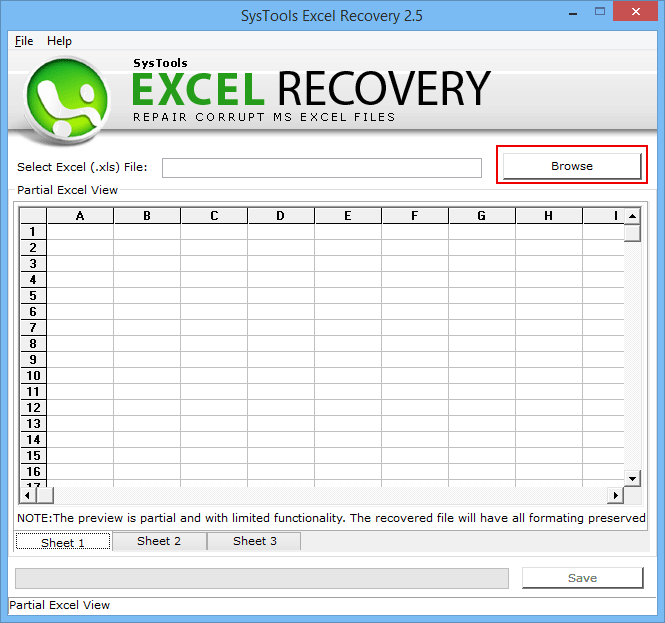 Does Excel File Recovery tool enable user to add multiple damaged XLS file simultaneously? Ans: No, a user cannot add multiple XLS files at the same time to repair corrupted Excel XLS file. However, numerous XLS files can be repaired one after the other. Q. Is there any definite amount of time to repair any given XLS file? Ans: There is no fixed amount of time defined by the Excel XLS Repair tool. The time period required to repair a corrupted XLS file to a healthy state depends on the size of file and configuration of the local machine. Q. 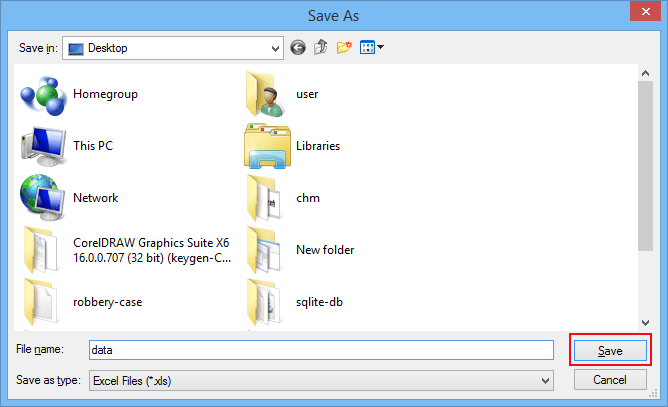 After recovery of XLS file, is the structure of file modified or remains the same? Ans: No, the Excel Recovery software guarantees that no data is lost or misplaced from the browsed .xls file after using XLS recovery tool. Q. Does XLS Recovery tool require an installation of Microsoft Office? Ans: No, installation and configuration of Microsoft Office are not required to repair XLS file using this XLS Repair Tool. Note: XLS Recovery Software will get delivered on your registered email id, within few minutes after placing the order. 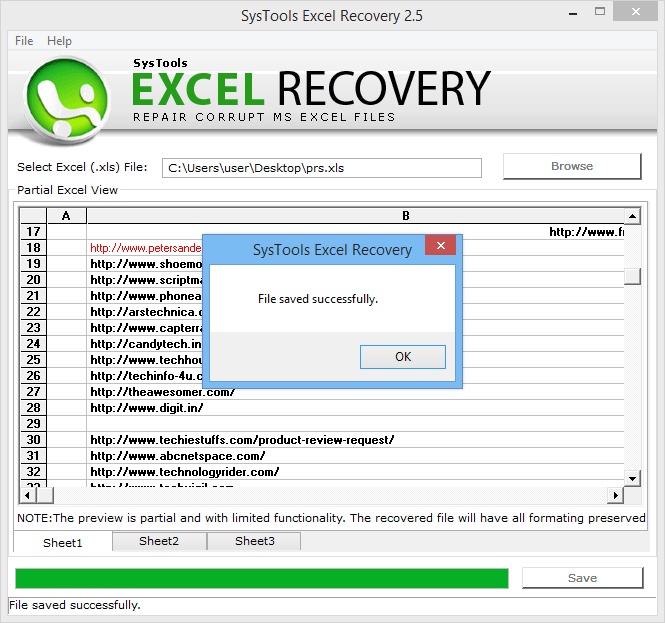 The best feature of this Excel Recovery software is that it does not require an installation of MS Office. XLS Recovery helps me to repair my orphan XLS file. Seriously, any utility cannot compete its speed, accuracy, and consistency. Moreover, the support team is very technical and resolves the glitches of customers as soon as possible. A few months ago, I cannot open Excel XLS file. Even though I know about many automated solutions, but I was afraid to use them. Then my friend, who is a software developer told me regarding this Excel XLS Repair tool. After his recommendation, I used this product. It produces very accurate results and it is very reliable. Thanks to your development team.